Pricing: £25, or £45 for 2 –bring a friend and save! There is no need to have a partner for the workshop, but we will work in groups. Experience: All Levels, but especially good for beginners and improvers. There will be something for everyone whether or not you came to the first workshop, all welcome! Join us for this playful 3 1/2 hour workshop! 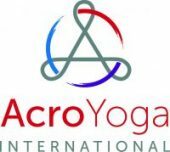 Acroyoga is a combination of yoga, acrobatics and therapeutic arts. Practiced in pairs or small groups, acroyogis work and play together to create balances, sequences, flows and healing hang-outs. The workshop will start with fun warm up exercises that help you understand and embody the roles of flyer, base and spotter. We will then invite you to experience some of the key poses of acroyoga. There will be a 15min tea break before we play with transitions between the poses, building an acroyoga flow. We finish with some therapeutic partner work for a relaxing end to an exciting day. You don’t need to be super-flexi and strong, or a mega experienced yogi or acrobat before you start. Practicing acroyoga will build flexibility and strength, but mainly it should be tried because it’s such good fun! It will certainly give your laughing muscles a good workout (there was so much laughter on our last Dumfries trip, we couldn’t resist coming back!). This workshop has a limited number of places, to register and reserve a place, please fill in the form below AND make a payment using the appropriate paypal link.